Apple Pay transactions in the first quarter of 2017 grew by 450 percent over the same quarter last year, said Apple CEO Tim Cook during the company’s quarterly earnings call in May. Much of that growth comes from expansion to new international markets over the last year. Apple Pay is now available in 15 countries, including the United Kingdom, Canada, Switzerland, Japan, Australia, China, Ireland, Italy, France, Hong Kong, Singapore, and Russia. But it’s important to note that smartphone technology also plays a role in the growth of transactions. The more people who have phones that support mobile pay, the more people who will use it. A recent study by IHS Markit forecasted that over 3.4 billion smartphones will be equipped for Apple Pay, Samsung Pay, and Android Pay by the end of 2017. This is expected to increase to 5.3 billion by 2021. And Apple has said in the past that one million new users sign up for Apple Pay each week. Of course, people can’t use mobile payments if businesses don’t take them. Apple Pay is already accepted at 20 million locations worldwide, including 4.5 million in the U.S., said Cook during the call. But there’s a ton of room for growth; there are 28 million small businesses in the U.S., according to the SBA. If you aren’t accepting mobile payments yet, it’s time to jump on the bandwagon. While you may not think you have a lot of customers who use the technology, you may be shutting out new business by not accepting it. Mobile payments like Apple Pay use near field communication (NFC) to process payments. NFC is the most secure payment type since it uses sophisticated layers of security like tokenization and cryptograms to lock down bank information. Furthermore, on many mobile payments solutions (like Apple Pay and most Android devices), you can activate fingerprint identification technology, which makes it extremely difficult for fraudsters to access anything within your phone. Speed is a common issue that consumers have with chip cards; it just takes too long to process a transaction. Not the case with mobile payments. Fifty-six percent of Apple Pay users and 67 percent of Android Pay users reported paying with their app more than once a week, according to our study on EMV and NFC technology. Why? They noted speed, convenience, and its utility as a backup wallet as the top reasons for use. It can grow your business. Consumers who use mobile payments love them. And interestingly, we found in our EMV/NFC study that accepting mobile payments can boost your bottom line. Not only did respondents say that they are likely to seek out stores that take mobile payments, they said they also tend to spend (and tip) more when they use their mobile wallets. Mobile payment use is rapidly expanding, and you should be able to provide options for your customers to pay. Try our contactless and chip reader to start accepting mobile payments like Apple Pay and Android Pay as well as chip cards. It’s just $49. 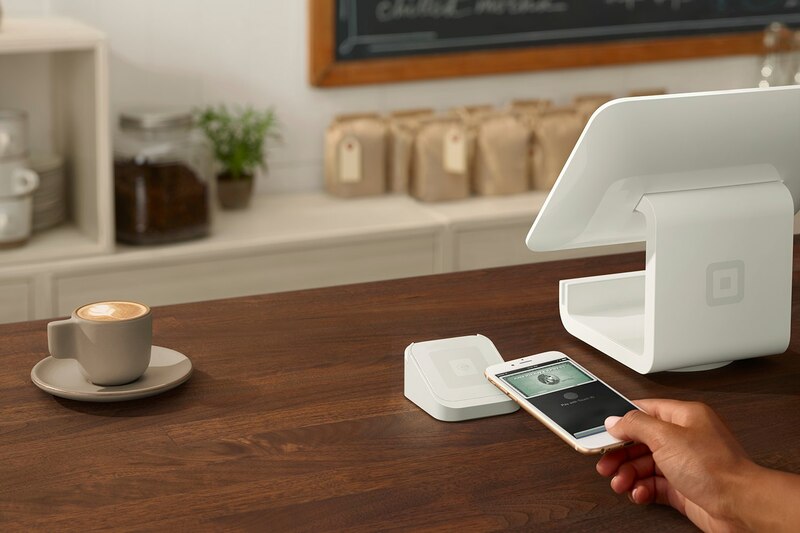 Once you have your reader, learn more about setting up Apple Pay at your business.